100cc injectable. A high potency injectable multi-vitamin solution for use in the relief of B vitamin deficiencies and to provide supplemental nutritional vitamins to cattle, swine, sheep. Dosage: cattle 1 to 2 ml per 100 lbs body weight, calves, sheep and swine 5 ml per 100 lbs. 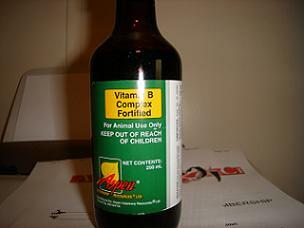 This Vitamin is the best in the world I really love to used it with my sick bird 100% help very fast.